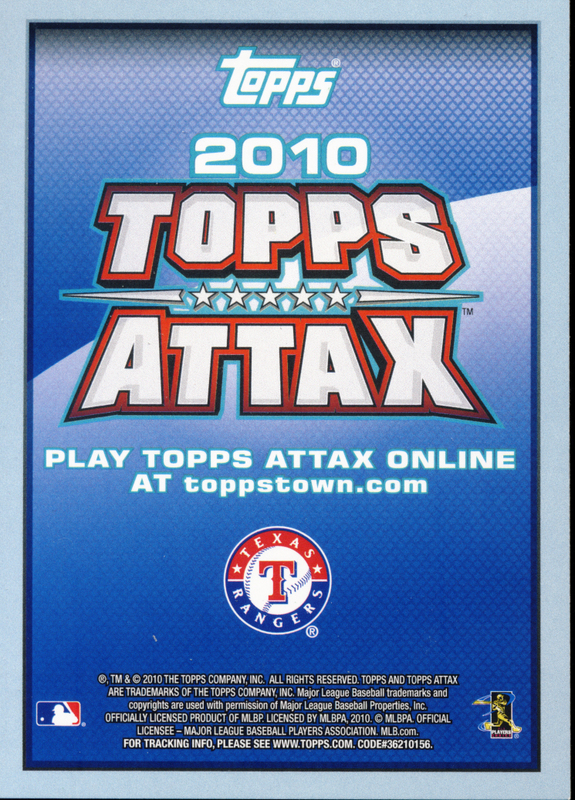 For some, mostly here in the United States, Topps Attax was a somewhat ignored insert card found in packs of last year’s Baseball cards. For the rest of the world, it was and continues to be a sensation. 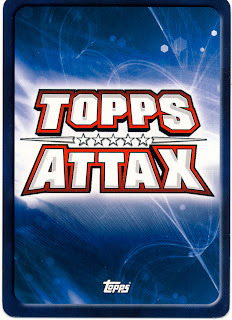 If you didn’t take notice of Attax in the past, this year’s Topps Attax Baseball is worthy of attention. With expanded play, it has evolved into a true role playing game. 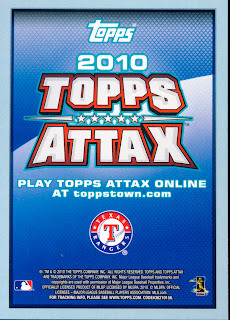 2011 Topps Attax Baseball Cards falls into our fun cards category perfectly. The cards are available in 12 card booster packs, 30 card value packs and a 60-card starter box that includes 2 ready-to-play 30-card packs, 2 deck storage boxes and a deluxe playmat. 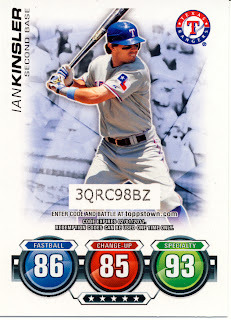 The checklist for the starter box is standard so here are the cards you will get in every starter box. 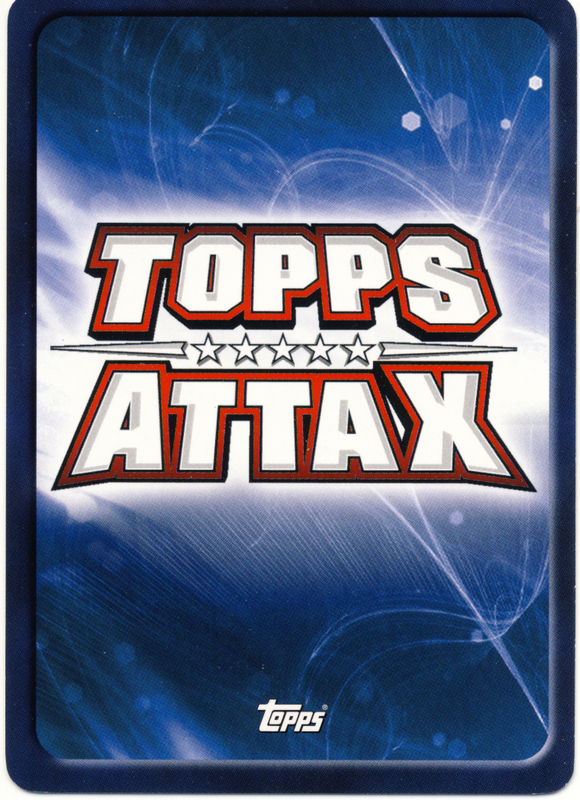 As you can see the 2010 Attax card, on the left, has the one game element, the three pitch rankings. 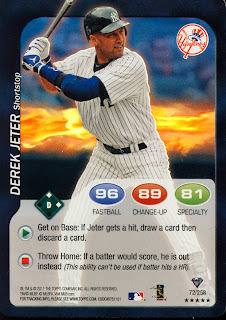 Game play revolves around who has the higher ranking, nothing else, so there are only two possible outcomes, the offense hits a home run or the defense gets an out. 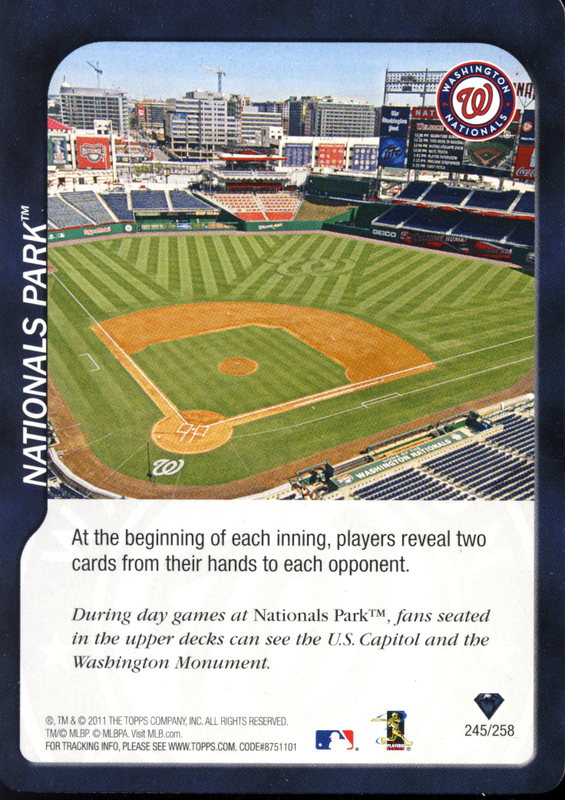 The 2011 version, on the right, has the pitch elements too, but also comes with the ability to use the card for defensive play, indicated by the red square. Other cards have offensive abilities, indicated by a green arrow and as you will see with the Derek Jeter and Buster Posey cards, some cards can be used or both offense and defense. 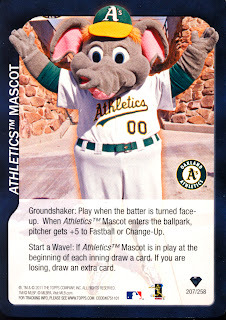 The green infield diamond shows the type of hit the card generates. 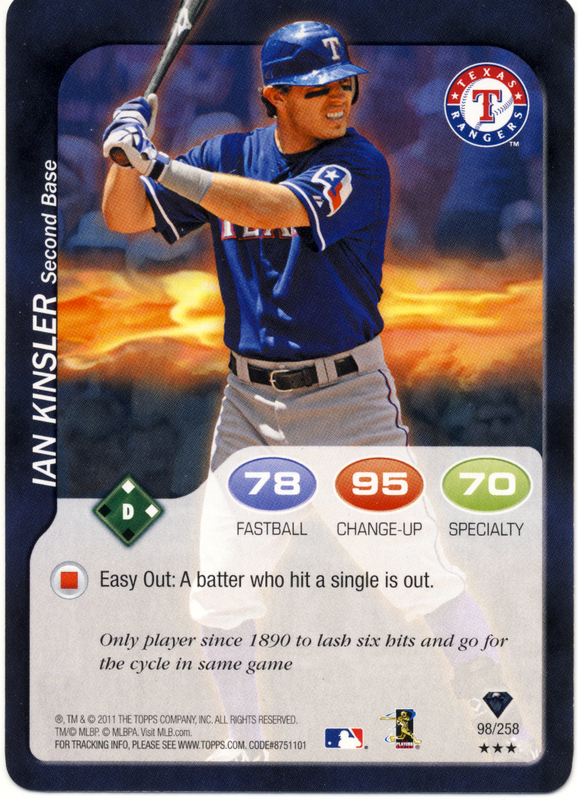 In the case of this Kinsler, it produces a double. These are the backs of the cards. The 2010 version had the player’s team logo on it. 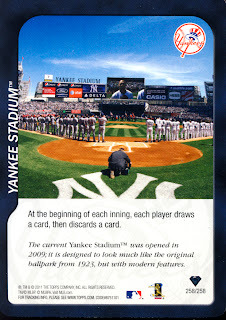 All of the 2011 cards look the same so they can be use like a regular deck of cards, enabling the all the details of the card to be hidden until exposed. And just like a regular deck of card, the corners are rounded and coated to allow a lot of handling and shuffling without damage, great for repeated play. The collecting element of these cards lies in the diamonds on the lower right hand of the cards. The 98/258 on the Ian Kinsler cards does not indicate there are only 258 of these cards in existence. That means the card is number 98 of the 258 different player cards. 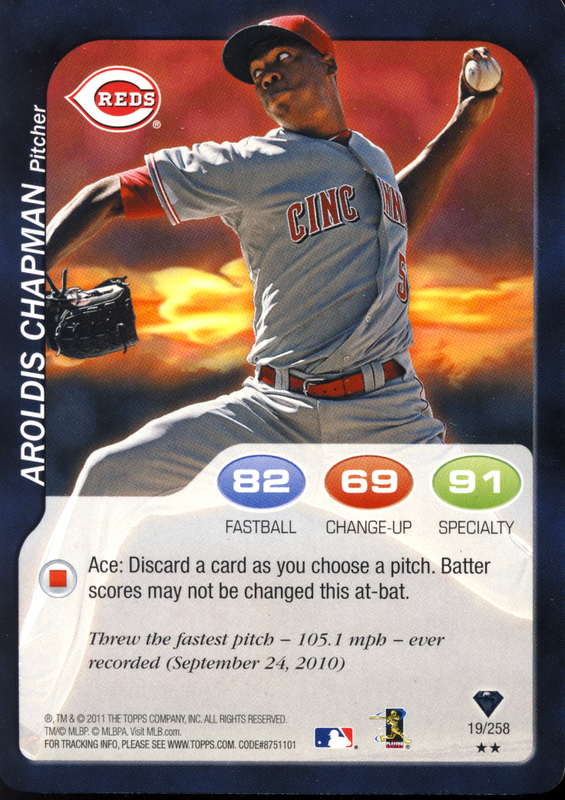 The rarity of the card is indicated by the color of the diamond. 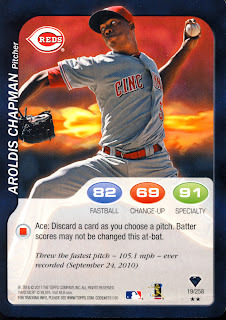 This Aroldis Chapman black diamond card is considered a common. 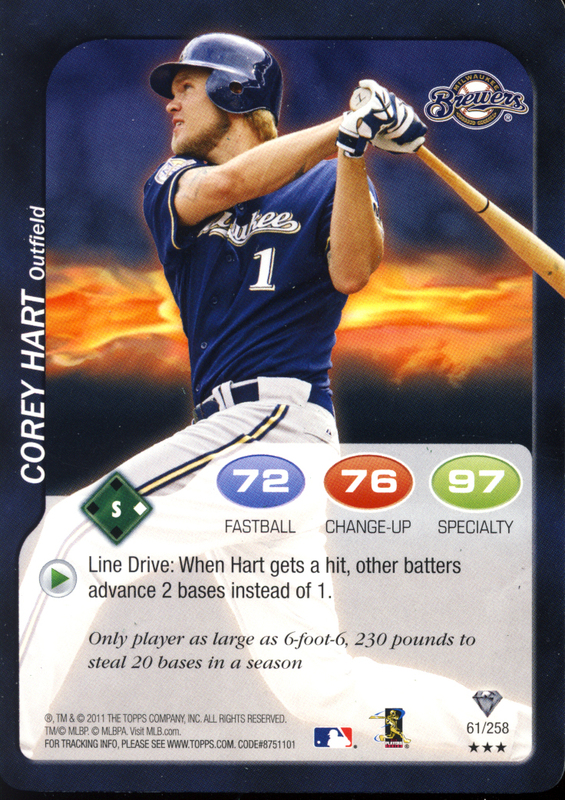 This Corey Hart silver diamond card is the next level up and considered uncommon. 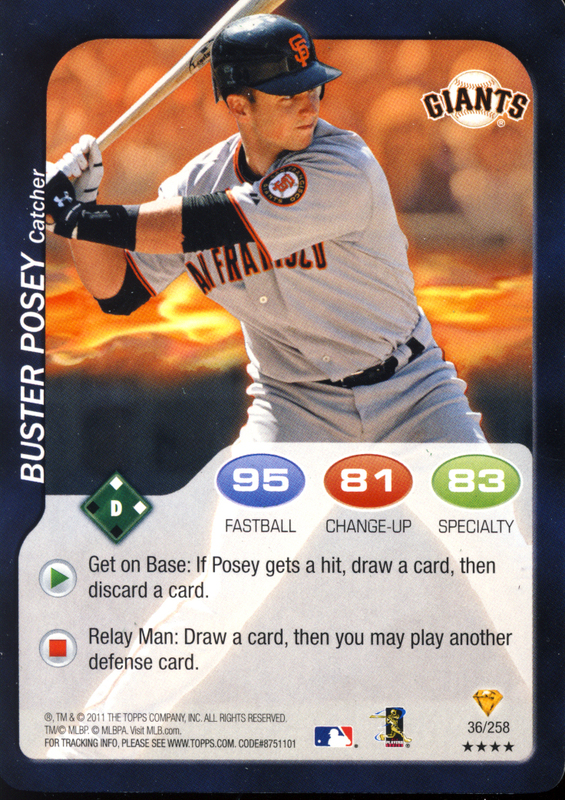 This Buster Posey gold diamond card is considered rare. White diamond cards are considered ultra rare and we didn’t get any in the starter box. For this year's game, two other types of cards come into play. 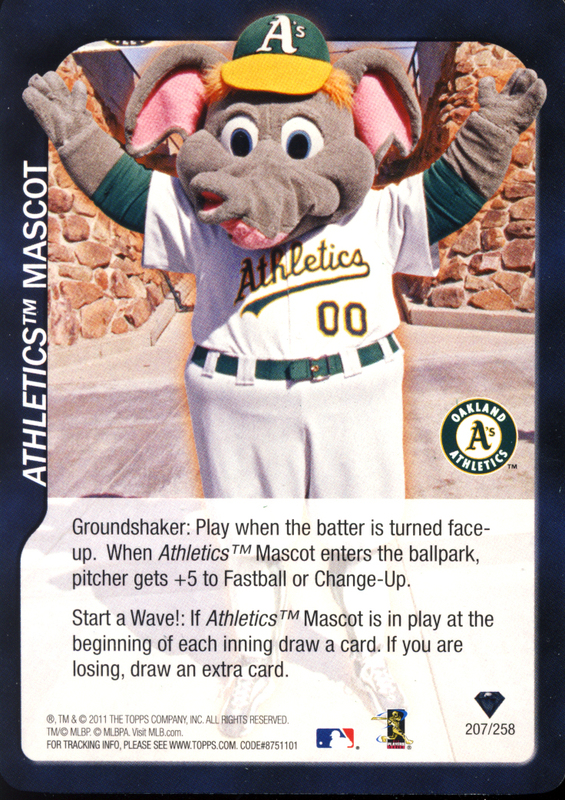 Mascot cards can be used by players to change the game. 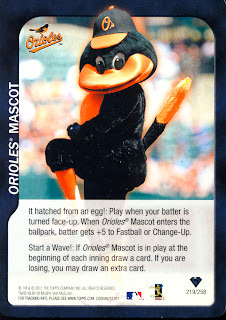 Included in the starter box are the Orioles and Athletics Mascots. 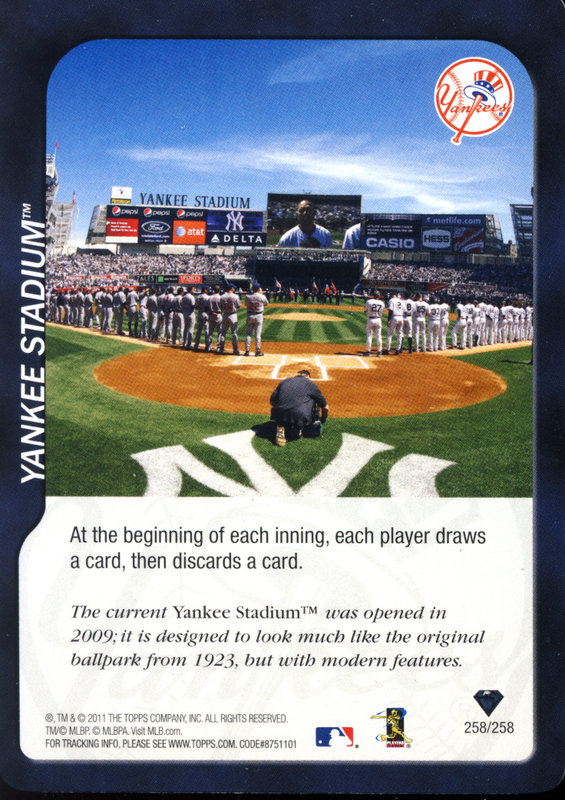 At the beginning of the game, a coin is flipped to determine who is the home team and the winner get to use their stadium, which also changes up the game. Included in the starter box are Yankee and Nationals Stadium cards. In the back of the Starter box you'll find is this deluxe playmat. A playmat was not necessary in the past and you could probably still get away without it, but game play is definitely better with it. As you can see there is plenty of play space, a brief summary of the rules on the play surface and an easy system to keep track of the innings, outs and score. It also has all the rules in detail printed on the back of the playmat. Also included in the kit, two of these deck holders. Great for keeping you current deck of cards organized. The other elements to chase for collecting sake are foil cards and we got two of those. 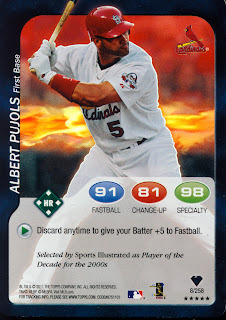 Albert Pujols and Derek Jeter foil cards. It's a little hard to tell from the scan but it’s obvious in person. We really like the overall redesign of these cards. 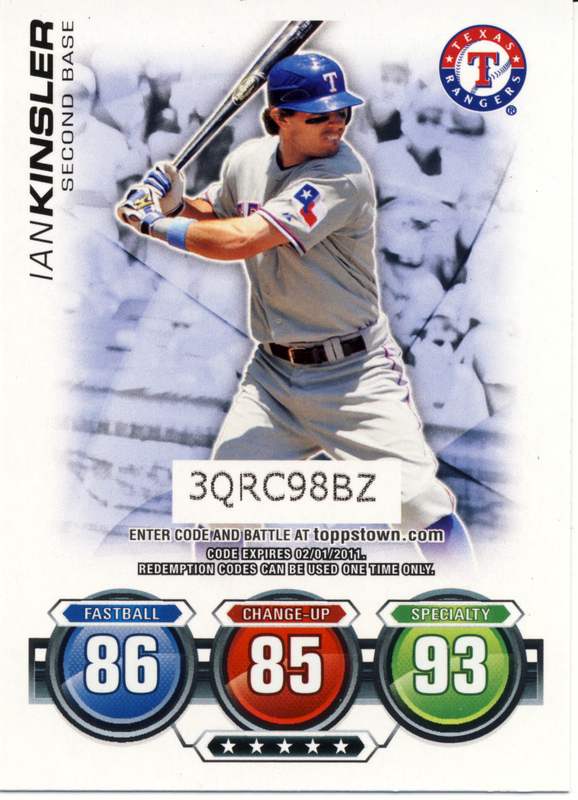 There are sharp looking cards this year. When you narrow down the all of the Major League Baseball players to 258 you wind up with quality players and still have plenty of variety. Absolutely. The game play is great with this year’s added elements. Really young children may find the new game is too complex, but that’s not a problem because they can still play last year’s game, now referred to as the Home Run Derby, by just using the three pitch rankings. Most definitely. The two teams included in the starter box are great and specifically designed to be balanced for easy, fair play right out of the box, but you’ll want the flexibility to fashion your team to your tastes and for that you’ll need more variety than what is provided in the starter box. That’s why there are booster packs. 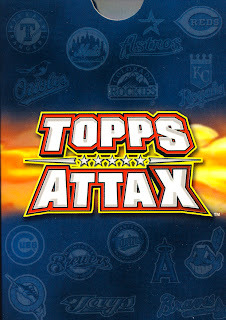 2011 Topps Attax Baseball is a great role-playing game for card collectors, the great hybrid. For a more on the details and complete rules for both Topps Attax Baseball games, use this link to go to the Topps web site.